Kick your sugar habit with easy and delicious recipes! 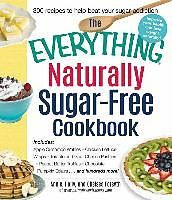 With 300 delicious, easy-to-make recipes for every meal of the day, you'll improve your health the natural way--and kick your sugar habit for good! Sous-titre: Includes Apple Cinnamon Waffles, Chicken Lettuce Wraps, Tomato and Goat Cheese Pastries, Peanut Butter Truffles, Chocolate Pumpkin Eclairs...and Hundreds More!